This page is dedicated to the special editions or limited editions of the most iconic products of Italian and international design. This 60th anniversary salutes the silhouette of the Egg™, the Swan™ as well as the design hotel - the SAS Royal Hotel - they were originally created for. Today, they represent the essence of Arne Jacobsen and his time of glory within Danish design. A time we want to celebrate through a selection of exclusive materials, a pure and natural colour palette and a constant respect for Arne Jacobsen's original ways of working. The serenity of nature was the starting point for the design process of the 60th anniversary. The idea was to unite the renowned heritage with a design that was relevant in time. The result is a design appealing to all senses with a mission to turn pure materials into personal design objects. The materials vary from the soft and serene PURE leather, to a 23 karat gold coated base, all of which will create patina and an expression of their own with time. After several years of joint development by Verner Panton and Vitra, the Panton Chair was finally ready for production in 1967 – as the first all-plastic cantilever chair to be manufactured in one piece. Created with a revolutionary production technique, the chair's unique sculptural design was presented to the public for the first time at the imm Furniture Fair in Cologne in 1968. It rapidly came to symbolise an entire era. In 2018, 50 years after its launch, Vitra is issuing Panton Chrome in a limited edition. Throughout his career, Verner Panton was fascinated by mirrored surfaces and experimented with diverse reflective effects more extensively than almost any other designer. This passion is evident in his works of furniture and lighting as well as many of his expressive interiors. With the new Panton Chrome edition, an old dream of the designer finally comes to fruition: back in the early 1970s he had explored the option of giving the Panton Chair a mirrored surface. He felt that the chair’s dynamic curves were particularly suited to a reflective coating; however, the sensitivity of such a surface to scratching was an insurmountable technical obstacle at that time. Today, almost 50 years later, a reliable yet complex procedure is available, one that involves highly specialised hand craftsmanship. The dazzling mirrored effect of Panton Chrome is the result of a metallisation process, in which metal particles are embedded in multiple layers of varnish. This complex coating system is resilient enough to cope with the slight movement of the cantilever chair when in use, while being sufficiently robust to efficiently protect the sensitive surface. The limited edition of Panton Chrome not only highlights the chair’s sculptural qualities in a spectacular way; it is also a fully functional piece of furniture that meets all standard seating requirements. 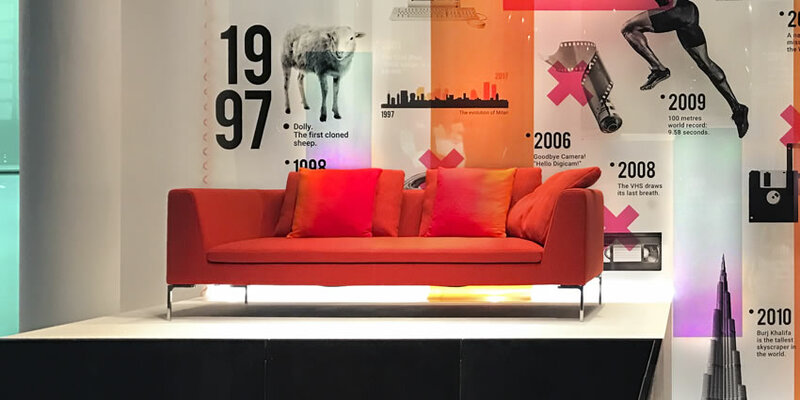 B&B Italia celebrates the 20th anniversary of Charles, the iconic seating system designed by Antonio Citterio in 1997, showcasing a special version which offers two new coverings in orange/red and grey/blue colours. A leading piece in contemporary lifestyle, Charles owes its immense success to both its shape and aesthetics and to the research and innovation that went into its design: values which are part of B&B Italia’s DNA and underlying themes in all of its projects. 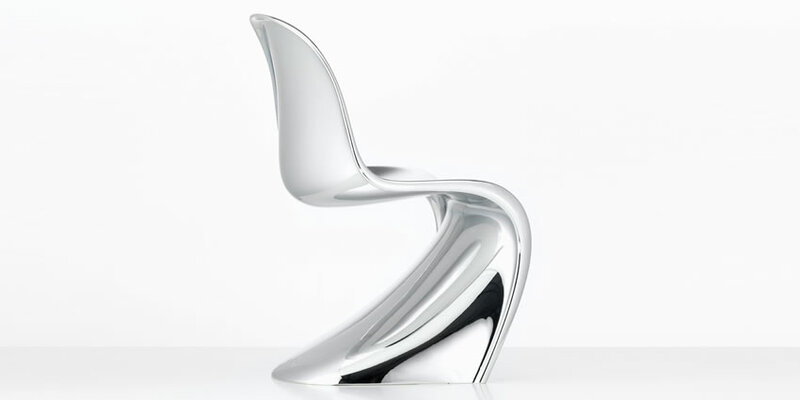 The characteristics which have made it a contemporary classic are numerous: a slim but strong structure, thanks to the metal frame embedded in cold polyurethane foam mouldings, a single seating cushion, a light appearance accentuated by the essential design of the “inverted L”- shaped die cast aluminium feet. High seat modularity starting with sixteen elements per type and different sizes - this is the concept behind Charles. The sixteen elements offer a wide variety of linear and corner compositions while the chaise-longue end units make peninsula compositions possible for open spaces. 20 years on from its debut, Charles reconfirms its qualities as long seller and bestseller product of the company and is still nowadays a reference model in the world of design worldwide. 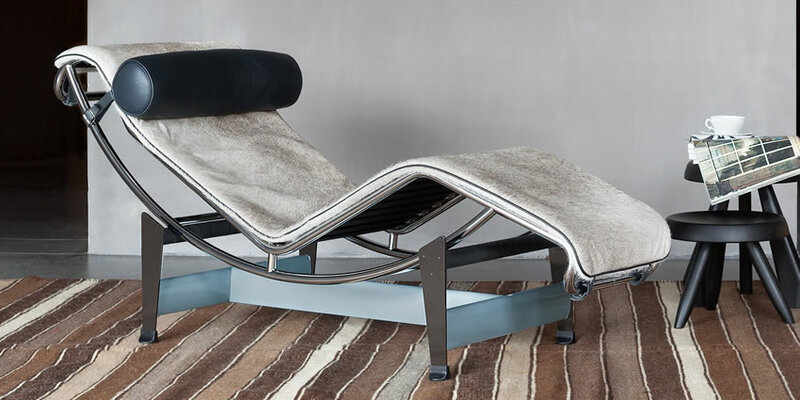 Chaise-longue with bicolour structure, steel cross bar with the drop section in light blue and four support bars in basalt grey. The mattress pad is in grey cowhide, sourced from Gascon cattle. The polyester padded headrest is in grey leather. This model was first created in 1928 for the Villa Church in Ville-d’Avray. 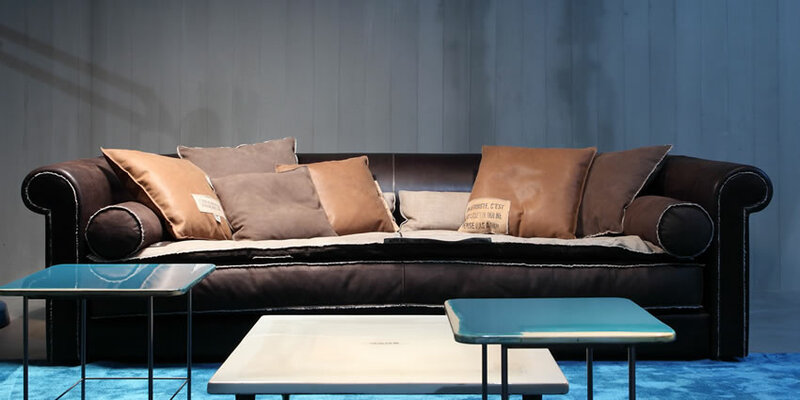 The distinctive features of this version are the tear-shaped cross section, the blue colour of the tube frame, the basalt colour of the four support elements and the light grey spotted horsehide mattress. The Panton Chair, designed by Verner Panton and developed by Vitra, is a classic in the history of furniture design. Vitra writes the history of your home ... and your outdoor spaces. In the spring we all feel like a touch of color, waiting for nature shoots and the sun warms our faces. 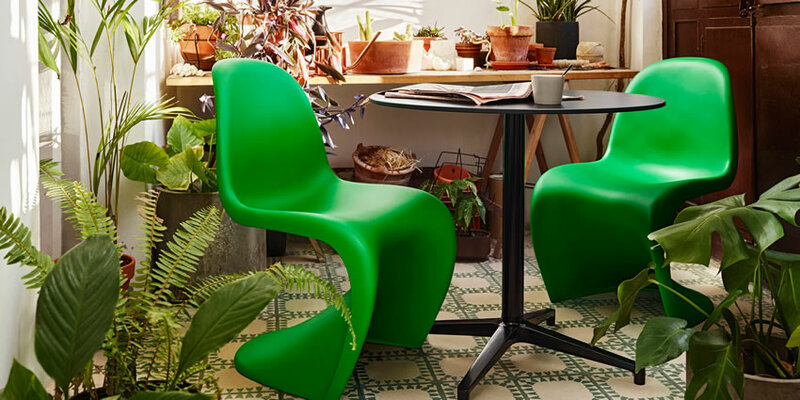 Vitra celebrates this special time of year with an exceptional Special Edition of the Panton Chair: the “Panton Chair summer green”. With this new special color you have the opportunity to create a unique and exceptional environments. The sofa Alfred Special Edition Trench by Baxter is an evolution of the sofa Alfred. 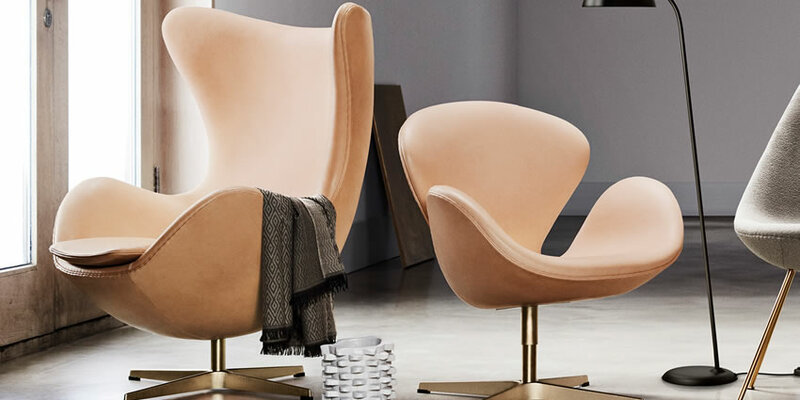 Same elegance and large spaces, but with more rounded shapes, it is padded with acrylic fiber and covered on one side in cotton on the other side in leather. It includes two rolls, two back cushions, and six deco cushions in washed and sterilized goose down. Its seams are edged with frayed linen insert and it has decoration with fabric and appliqued leather labels, silk screened by hand according to the creativity of the artist. Each piece will therefore be different and unique. It is available in two colour version: with River Nelson body or in Bo.Hemian Kaki. - Sahara noir: Rich black with random white and golden red veins. 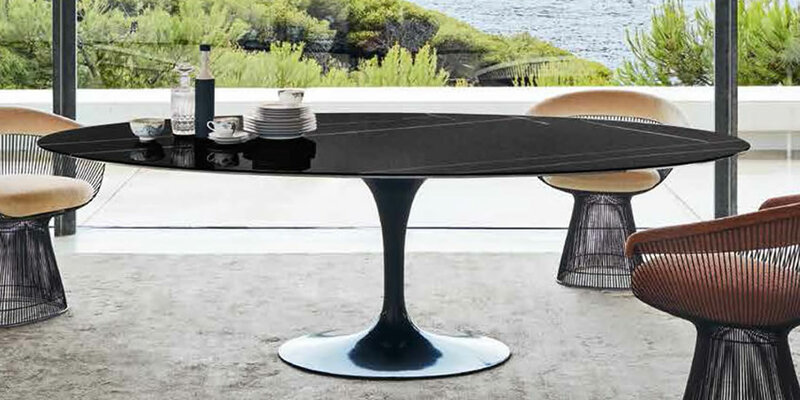 Poltrona Frau presented the new Bolero Limited Edition, an elegant table designed by Roberto Lazzeroni, now available also in a numbered limited edition of 41 pieces. Launched during a celebration dinner organised in a lovely venue, the exclusive ancient Roman marble quarry Piastrone - Bacino di Gioia - in the province of Carrara, Bolero Limited Edition was presented to the public in a unique, almost surreal setting. The 41 models, numbered and marked from 00/40, were dots on a splendid white marble landscape. Visitors enjoyed a fantastic, and completely different view of the furnishings. Each one is made with a different marble top, thanks to a special process using abrasive brushes to make random markings in the surface. 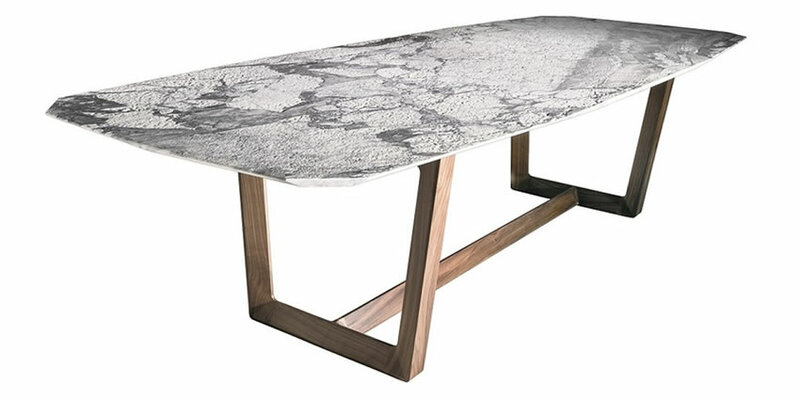 The tables on display all have singular textures that change depending on the hardness of the marble used. The marble used for the tops is of the "Arabesque" type, a quality of white Carrara marble with grey veins called "arabesques". The tables are large - three meters by one - and shaped like elongated irregular 12-sided polygons, sort of a oval with many facets. The table base, however, is American walnut with a semi-gloss oiled finish applied by hand, and the surface has a special finish called "moonface". This type of finish gives the marble a rugged three-dimensional look that mimics the appearance of an unfinished natural stone. The edge is also unique, different on each side of the table according to a specific symmetrical scheme. 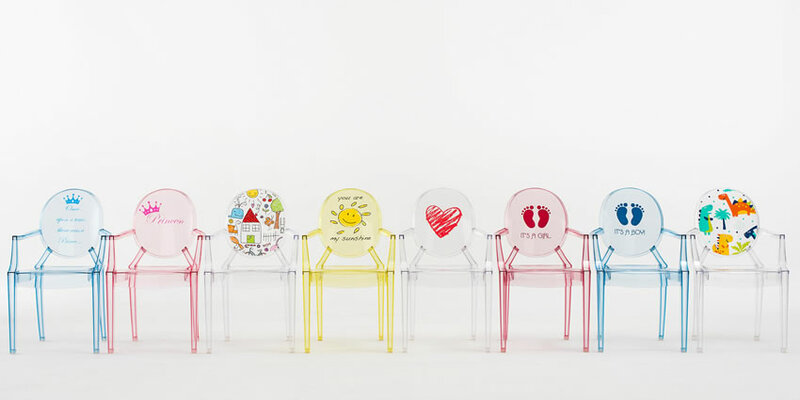 The miniature version of one of the most famous design chairs joins the Kartell Kids line in several new versions. Philippe Starck's Lou Lou Ghost gets new and customisable graphics for the fun world of kids. 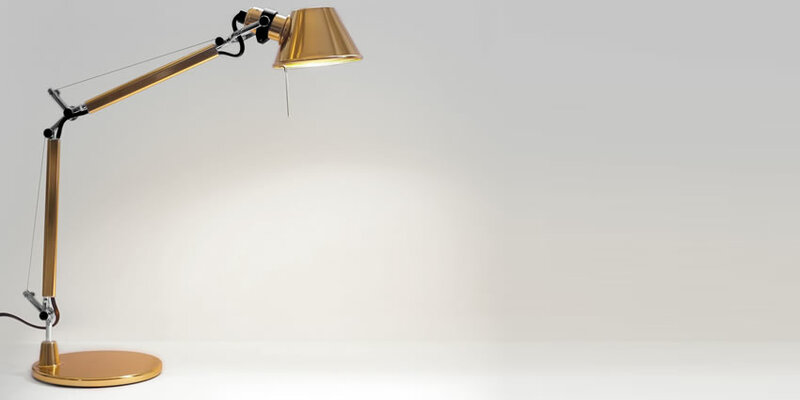 The Tolomeo Micro Tavolo Gold is one of the well known designs of Artemide. The design is by Michele de Lucchi and Giancarlo Fassina. The Tolomeo is available is several sizes and colors. This limited edition has a golden finish. This lamp can be used as a desk lamp as well as on a nightstand. Some of the proceeds of the Vanity Fair Limited Edition will go towards the construction of the Farm Children’s Museum in Favara, a special place devoted to children within the Farm Cultural Park. The new centre will be open to children of all ages and their parents, for educational activities in which the children will get the chance to learn using their creativity, their hands, their colours and materials. The armchair expresses the world of adults and the essence of Poltrona Frau elegance. Special upholstery in Pelle Frau® Nubuck Seppia, exclusively developed by Poltrona Frau and inspired by the tones of Sicilian tuff rock and the ancient Arabic settlements on the island. 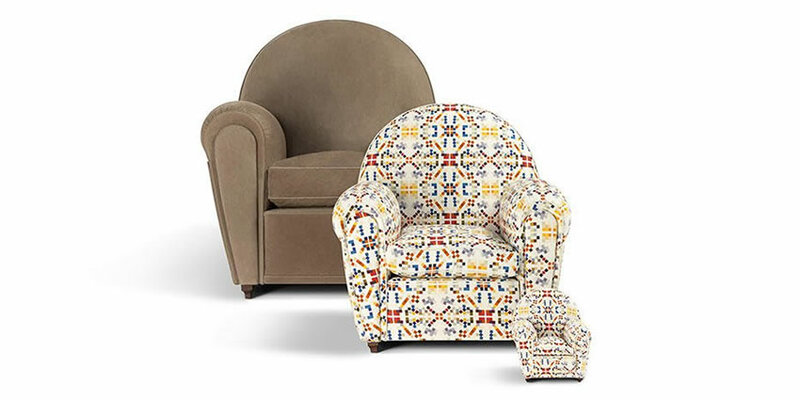 The piping in tone-on-tone fabric embellishes the edges of the seat cushion and the edges of the armrest plates. Two thirds exactly like the original. For the children in the house, to instantly instil a taste for beauty. A combination of Vanity Fair and Baby Vanity Fair. A cross between a toy and an ornament, bringing together the adult world and the children’s world. It is elegant and refined, yet at the same time colourful and cheerful. — leather with coordinated armrest. 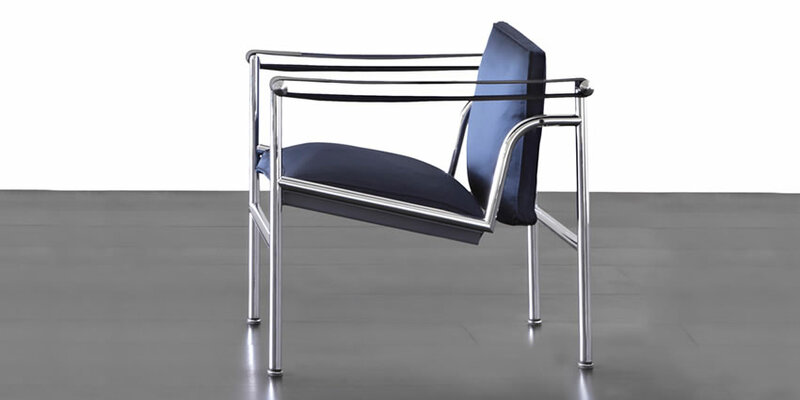 In this version of the sling chair, designed in 1928 for the Villa Church à Ville-d’Avray, the seat and backrest were padded to meet the client’s request for maximum comfort. Also in 1928, a similar padded model was created for the art gallery of collector Raoul La Roche. These first prototypes were used to define more accurately the structure of the 1929 model for the Salon d’Automne.